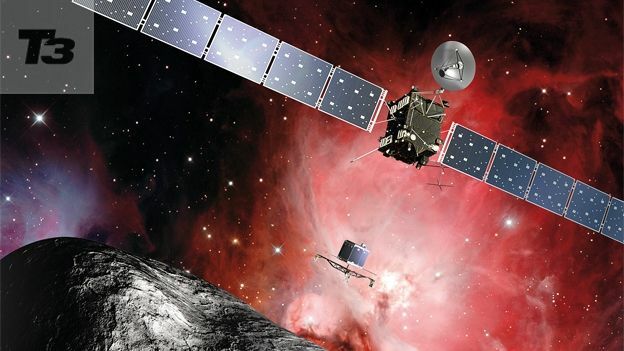 The European Space Agency's robot spacecraft Rosetta has finally been woken up by remote control this month, having travelled 6.2 billion kilometres since its launch ten years ago – the equivalent of orbiting Earth 154,709 times – and having “slept” for the past three. When Rosetta reaches its destination, Comet 67P/Churyumov-Gerasimenko, in August, it will investigate how this titanic ball of ice exists so close to the Sun and, inevitably, whether we can use it as fuel. By November, after four months of picking the right parking spot, scientists will place Rosetta around 1km away from the comet then launch the lander at effectively walking pace. The 100kg Philae landing craft will then drill into the surface, Armageddon-style, to study the results. To withstand the deadly wastelands of a comet's surface Philae has been built to survive a knock or two. Rather than simply being covered in carbon fibre the body is built from it and then coated in aluminium, this provides the perfect balance between weight saving and protection. Once it lands it'll fire a powerful harpoon into the surface of the comet effectively anchoring it, from there it'll use solar panels to power its 1 watt transmitter sending back data to Rosetta. Another spacecraft that has been making the headlines is Gaia (see below), a spacecraft with a science assignment so gigantically challenging it'd make your 12-year old self opt for a written test. Launched by the European Space Agency Gaia's mission is simple, to create the first 3D map of the Milky Way. Think of it as a giant version of Google Earth, except it'll be, you know, mapping the entire galaxy. To be able to get a clear picture Gaia will travel out to a distance of around 1.2 million kilometres, from that distance it'll take it 180 days to orbit the Earth where it'll remain for the next five years.